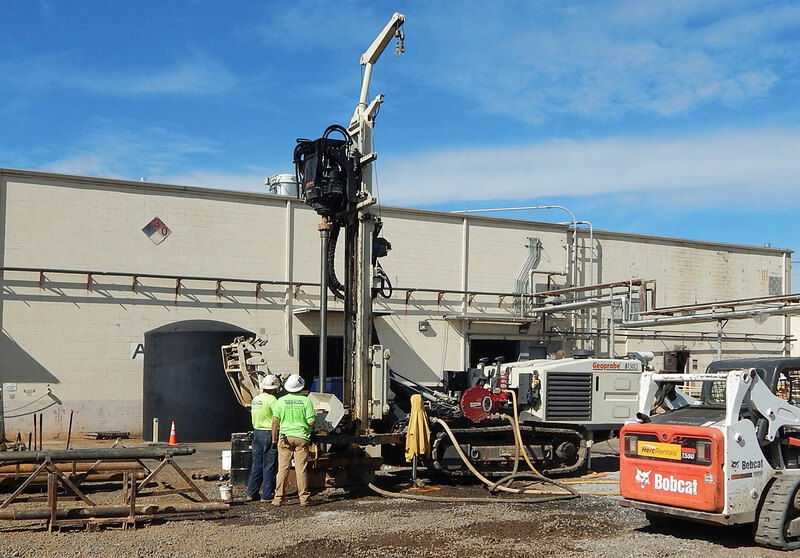 In addition to Direct Push Technology and conventional drilling services, SAEDACCO also offers Roto-Sonic drilling services. We currently utilize Geoprobe 8140LS and 8150LS sonic drills. These drills are compact, track-mounted, capable of using both 5 foot and 10 foot tooling and are equipped with the Geoprobe hands-free rod handling system for improved drill crew safety. In addition to these features, we can offer our clients angle drilling and borehole sizes ranging from 4 inch to 14 inch diameter. While the sonic drilling method delivers outstanding sample cores of unconsolidated material, we can also utilize tooling specifically designed for rock coring and discrete groundwater interval sampling with these drills to provide a complete sampling and well installation package in complex geologic formations. SAEDACCO sonic drilling services can offer you superior sample collection, drilling waste minimization, a rapid drilling process, well construction without the impacts of borehole collapse and a high level of added safety the hands-free rod handling system... In summary, a superior drilling experience. "Crew works well together, follows good safety practices and completes the work in a timely fashion. Also, operate heavy equipment in a safe and proficient manner." Copyright 2015 SAEDACCO | eData Login | Mobile-ready websites by Web Station, Inc.